After World War II, the U.S. intelligence community became increasingly concerned with the USSR’s mysterious ability to convince US citizens to commit acts of treason. Indeed, it was through such intelligence efforts that the Soviets were able to end the short-lived US monopoly on nuclear warfare. As you can imagine, this deeply frustrated the CIA. If the Soviets had the ability to steal the crown jewel of our state secrets, something had to be done. So, the CIA launched its own research on coercion and manipulation. Their aim: come up with a bulletproof method for flipping spies (and other intelligence assets) to our side. The results of this research are, of course, classified. In public, it’s stated the program ended “inconclusively” but given that it went on for decades (at least), this is obviously just a cover story. Thankfully, due to the Freedom of Information Act, enough of this research has been declassified that one can piece together their findings and reconstruct this formula. And that’s exactly what my team has done. 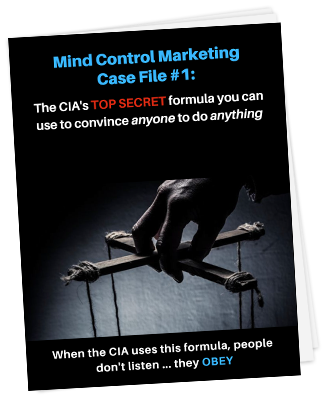 WARNING: this formula is extremely powerful and unlike anything you’ve read in any publicly available book about persuasion. It is reported it can even be used to manipulate people to do things against their will. DO NOT DO THAT. My personal feelings about the ethics of persuasion are thus: we’re all persuading each other all the time … Therefore, getting good at it is a requirement to win at life. You’ll either master persuasion, or those who have will become your masters. That said, we do have a responsibility in how we use these skills. With them, we shape the world around us. We’d all like to live in a happier and healthier world, and using persuasion to harm folks is not the path to get there.